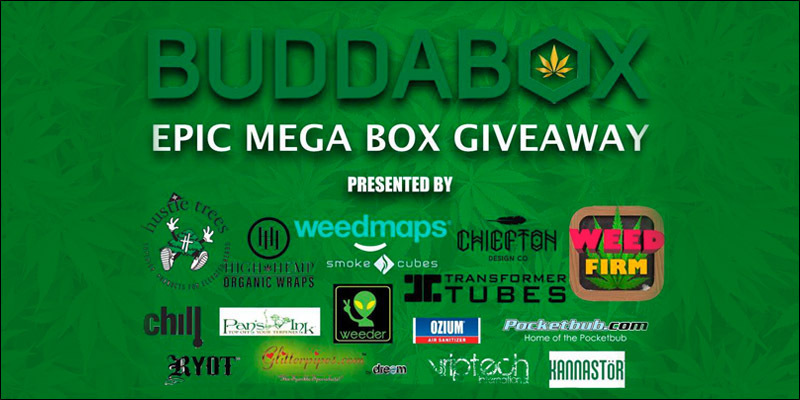 If you want to win over $500 in amazing goodies from the best cannabis subscription box in the business, you need to go to BuddaBox. The only joy greater than epic smoking gear is the joy of FREE epic smoking gear! If you want to win over $500 in amazing goodies from the best cannabis subscription box in the business, you need to go to BuddaBox. So big it needs two enhancements in the name, this contest has some of the coolest stoner essentials gear today. Here’s just a taste of the Epic Mega Box. Who hasn’t gone nuts over this amazing creation? A pocket pipe you can percolate? PocketBub’s Portable Glass Bubbler saves the day. This Transformer Tubes 3-piece bong is badass. Quick change from a thundering trumpet to a low-key loader, because this bong changes to fit your style. Now that is something worth celebrating. Forget the breakability of glass. BuddaBox put Chill Gear’s 2-foot tall behemoth in the Epic Mega Box as well. This smoking accessory line, dubbed “Forever” bongs, could be the one bong to rule them all. We all love some sharp gear to stylishly display our devotion to the dank. The folks at Chiefton Supply know exactly that feeling. That’s why they make some of the coolest snapbacks around. Want to heat those dabs to molten magical temperatures without burning the butane? Then get an eyeful of the new era of all-glass heating. VRIP TechLuxury Glass Vaporizer. No flame, no fuel. Just clean, windproof heat on demand. What else can you find in this ultimate weed box wonderland? Well, why not a whole extra box of gear! The guys have thrown in everything curated for the 420 Tokémon Box, just to start. If you want to see everything you wish you could get for your birthday, head over to the BuddaBox giveaway to enter. On top of the sweet goody box, BuddaBox backs up their product with top-of-the-line customer service, and offer a guaranteed piece in every box, even their lowest priced box! Free shipping, complete discretion, and a money-back guarantee are just icing on the cake. They are the most responsive 420 subscription box out there with Facebook messaging, phone support, email, and even Snapchat. Their Snapchat is insane! Add them @buddabox420. Have you entered the free contest? What are you waiting for? Tell us your excitement on Facebook, Twitter, or in the comments below.